Were it not for a ridiculous implosion against Michigan State, Wisconsin would be sitting alongside undefeateds Auburn and Oregon, hoping that they'll be in Arizona for the national championship game. Wisconsin is that good. It's not surprising, then, that Michigan struggled so mightily against an oversized, veteran unit that is unquestionably the best outfit in the Big Ten. That doesn't make Michigan's complete inability to stop the run or their general defensive incompetence any less disappointing, but it does mitigate it somewhat. By the second half, Wisconsin had completely abandoned the passing game, but it didn't matter. The Badgers stable of backs averaged 6.2 YPC on an astounding 58 carries. Scott Tolzien, meanwhile, went 14/15 for 201 yards--his only incompletion was an interception to James Rogers which sort of stopped the bleeding at the end of the first half. But again, none of this surprised anyone. Tolzien is a senior quarterback with all the talent to torch Michigan's secondary. And most of their starters are 4th- and 5th-year seniors. If you could describe the perfect storm for Michigan, it was Wisconsin. The more bothersome aspect of the game was Michigan's offense getting shut out in the first half. Denard overthrew a clear touchdown pass and Broekhuizen missed yet another field goal. So there were points to be had. 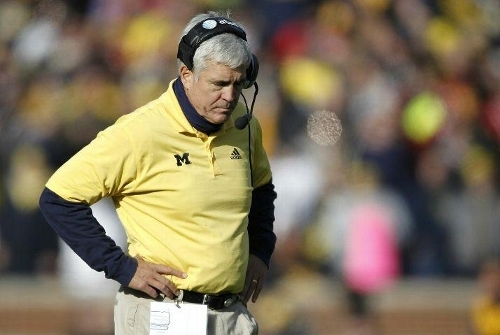 But in general, Michigan's offense was thoroughly stymied in the first half. I'll have to rewatch the game to see if Michigan made any changes in the second half or just executed better, but the offense finally got going behind the legs and arm of Denard. Receivers: Darryl Stonum had, by far, his best game this year and possibly his best in a the Winged Helmet. That over-his-head catch that he made at the four yard line was utterly ridiculous, and he was getting separation on cornerbacks all day. Roundtree, on the other hand, is proving a bothersome trend of dropping sure catches. I don't know why this has started to happen, but every week, it seems like we can count on at least one Roundtree drop. Injuries to Roh and Martin are bad news for Michigan's defense. Losing one or both for the Ohio State game spells certain doom. Vincent Smith looked like he had another good game, but the box score begs to differ (50 yards on 11 carries). Stephen Hopkins, meanwhile, should probably start losing some of his carries. This is the second straight week that he's looked overmatched and unable to make proper cuts. Jeremy Gallon, argh. Yet another game that Gallon looked terrible on kick returns, punctuated by the injury/fumble. It was amazing to see the different between Gallon and when Stonum/Drew Dileo started returning. The latter two were both able to make good cuts and get upfield in a hurry. I have no idea why Gallon is allowed on the field. Michigan's handling of the end of the first half didn't really bother me. Given how the offense was moving the ball in the first half, not taking shots downfield was fine. Especially when it was clear that, if given any time at all, Wisconsin's offense would march down the field on Michigan. An interception probably heeds more points for Wisconsin. Agree with all bullet points. I certainly do not think Jeremy Gallon deserves any more opportunities to see another kick return, ever. I'm happy with Drew Dileo and Stonum, assuming he is 100% healthy, returning all kickoffs and punts. Denard did play well - in a game against a top 5 team - the team can't afford to lose out on potential TD opportunities due to overthrown balls. It is what it is - he did play well other than that. Interception not his fault. It does seem like every Denard interception follows a dropped ball. Strange. Behind this team 100%. Go Blue!